Ahh, the coveted Mountain Collective Pass, your golden ticket to skiing some of the best resorts in the world, two days at a time for one mighty reasonable rate. The perks associated with the $409* price tag should make pulling the credit card out easier than grabbing the first round of après drinks. The only buyer's remorse that might be associated with the purchase is figuring out which ski hill to hit first. With ten top-rated destinations spread throughout North America and another four scattered around various other reaches of the world, pinpointing stop #1 can be a daunting task. Not to worry though, we've laid out the perfect Mountain Collective road trip that will drop you into a diverse range of jaw-dropping, close-proximity terrain while at the same time giving you the best bang for your buck. Tucked in the heart of the intermountain west lies a primo trifecta of adjacent ski resorts worthy of being at the top or your Mountain Collective checklist. 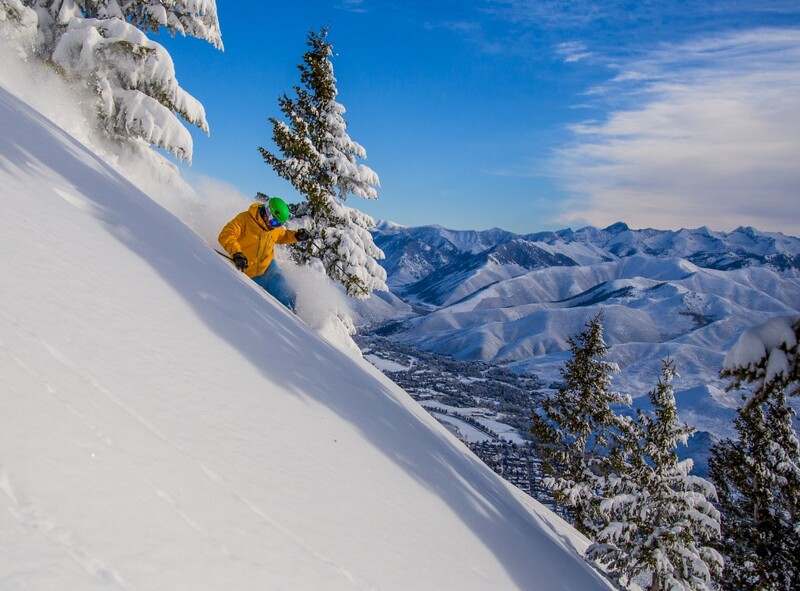 Snowbird/Alta, Snowbasin, Sun Valley, and Jackson Hole are chock-full of credentials, including big vertical descents, diverse terrain, and heaps of snow. To top it off, these mountains all sit within a five hour or less drive from one another (1hr flight if driving isn't your thing) making them prime real-estate for a Mountain Collective road trip. Here's how to tackle these beasts in one fell swoop. Salt Lake City is a great starting point and very easy to get to. Delta uses the SLC International Airport as its preferred western hub and as a result, delivers hundreds of daily direct flight options. Don't overthink it, just book it! To make life easy, pick yourself up a Chevy Tahoe from Avis. It'll give you the benefit of 4-wheel drive and ample amounts of room to accommodate gear. Hit the road for the 45 minute drive up to Little Cottonwood Canyon where Snowbird and Alta reside. Check-in for your first night at the Cliff Lodge. Odds are that you'll be up earlier than a kid on Christmas with the anticipation of your first day of riding. Swing down to Baked & Brewed in the Snowbird center to ease the nerves with a quick breakfast and reviving cup of joe. After a long day of traveling, a warm-up run might be in your favor before tackling things head on. The Peruvian chair will whisk you up to a selection of mellow groomers while feeding anticipatory first glimpses of the terrain that awaits you (if it snowed more than 6in overnight, disregard the warm-up run and proceed straight for the Tram). 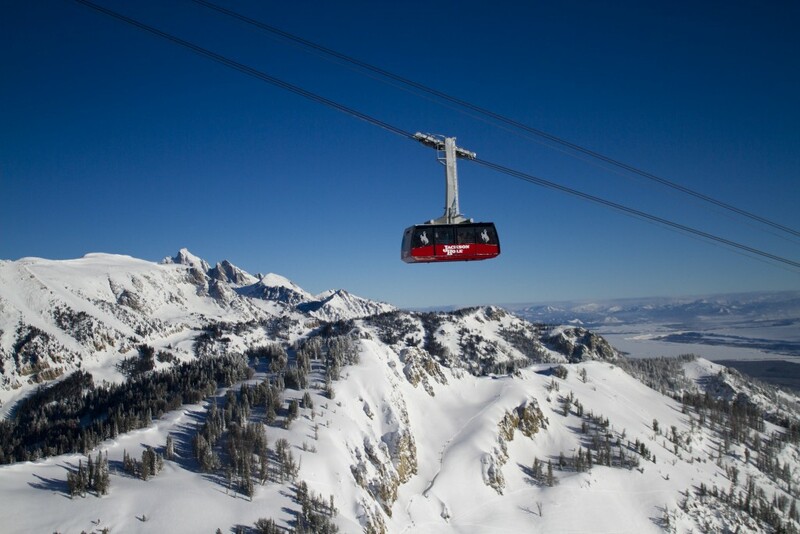 The Tram is your golden ticket to accessing nearly all of Snowbird's bounty. You'll be effortlessly whisked non-stop from 8,100ft to 11,000ft in roughly 8 minutes. Cut your teeth on famed runs such as Silver Fox, The Cirque, Wilbere's Bowl, and High Baldy. A few laps on the Tram are bound to leave you famished and eager to give the trembling legs a rest. Grab lunch at Snowbird's newest "crown jewel", The Summit. Inside the 23,000 sq ft space you'll find hearty, healthy meals and all-time views. Part 2 of your day deserves a little bit of exploration into the reaches of Mineral Basin. Enjoy the playful, rolling terrain highlighting runs such as Blue by You, Not Quite Corn, and the Bookends. End-of-day libations will be awaiting as you make your way back to the base of the mountain. Head to the Tram Dock to recount your favorite lines over a frosty Tecate. If the weather isn't in your favor, dip downstairs to the Tram Club for the cozy, sports-friendly atmosphere. As the night sets in, there are two routes that you might take depending on the board(s) under your feet. If you're a skier, make the quick journey up the road to Alta where the Peruvian will be awaiting with a tasty meal and a comfy nights rest (skip over to the Skitzmark in the Alta Lodge for a nightcap). If you're a boarder, you might as well stay put (come daytime, Alta only allows skiers on the lifts). The Cliff Spa's heated rooftop pool is calling. Also, ample food options can be found throughout the property. Day 3 - Get Pitted at Alta *If you're riding the shred stick (snowboard), enjoy another day of exploration at Snowbird as Alta does not allow snowboarding at their resort. Other noteworthy zones at Snowbird include: Knucklehead Traverse, Temptation Bowl, and Mushroom Land. With another big day of skiing ahead, a filling breakfast should be a top priority. The Rustler and the Peruvian breakfast buffets will both treat you right. If you're more of a coffee-only morning person, check out Alta Java in the Albion basin (if it snowed more than 6in, skip breakfast and proceed to the lifts as quickly as possible). The Collins lift offers some of the best access to Alta's classic runs. You can shake the lactic acid build-up with a quick groomer from here or choose to launch straight into the steeps with famed runs such as: High Rustler, Lone Pine, Eagle's Nest, Greely Bowl and the Shoulder Traverse. When the access gates are open, some of Alta's best terrain can be found just a quick bootpack away from the Sugarloaf lift within the Devil's Castle area. Yet another great spot that tends to see a bit less traffic is the Supreme lift. Peer off the backside for an expansive view of the Heber valley below before venturing down runs like Piney Glade, Hammerhead, and Last Chance. When the legs start to tremble from the endless powder laps, it's time pack it in and hit the road for part two of your Mountain Collective road trip. On your way out of town, call-in an order for a sandwich from Feldman's Deli - 801-906-0369. Snowbasin is roughly an hour drive from Salt Lake City making the early morning mission from the big little city more than doable. The powder panic getting here is much more subdued than it's counter parts so hit play on that Stevie Wonder mix, sit back and enjoy the ride. Grab your caffeine fix and a cinnamon roll at Grounds for Coffee in Layton along the way. 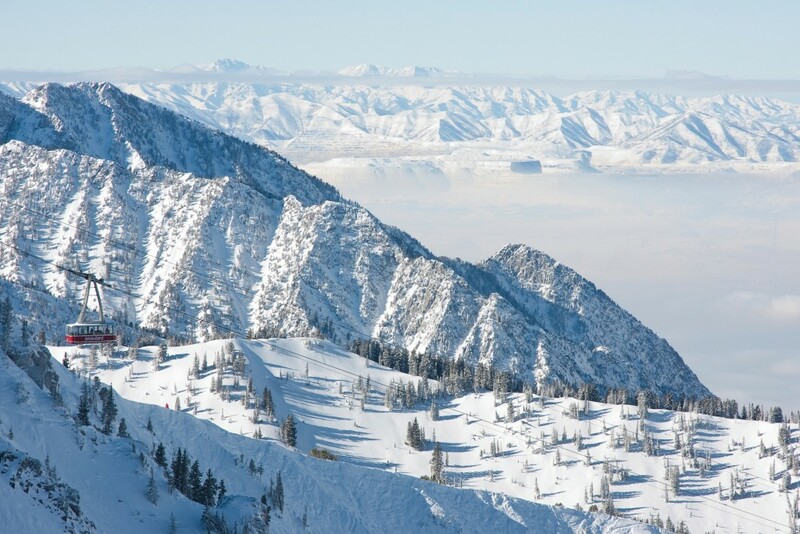 Pulling in to one of the sleeper ski resorts of the Wasatch will leave you leaning back in your chair. Trams, gondolas, and lifts galore spider off in all directions. Trying to pick the best routes can be leaves one scrambling for a map and an extra cup of coffee. Fret not, we have a few recommendations to keep you on track. We're going to give you the option to get the groomer goods today. The John Paul quad will be calling with ample servings of fresh courd. Skiing the 2002 Olympic "Grizzly" Downhill course is a must. You'll find plenty of carver-friendly terrain off this lift all day long. If you find yourself there on a sunny day, be sure to take the Allen Peak Tram for the sweeping views of the Wasatch Valley. John Paul's mid-mountain lodge is an easy option for re-fueling. Treat yourself with their bacon & brie tuna melt. For the afternoon, head for the Needles Gondola. Dip in to Pork Barrel and Wildcat Ridge or simply follow your intuition and point them down the fall-line. 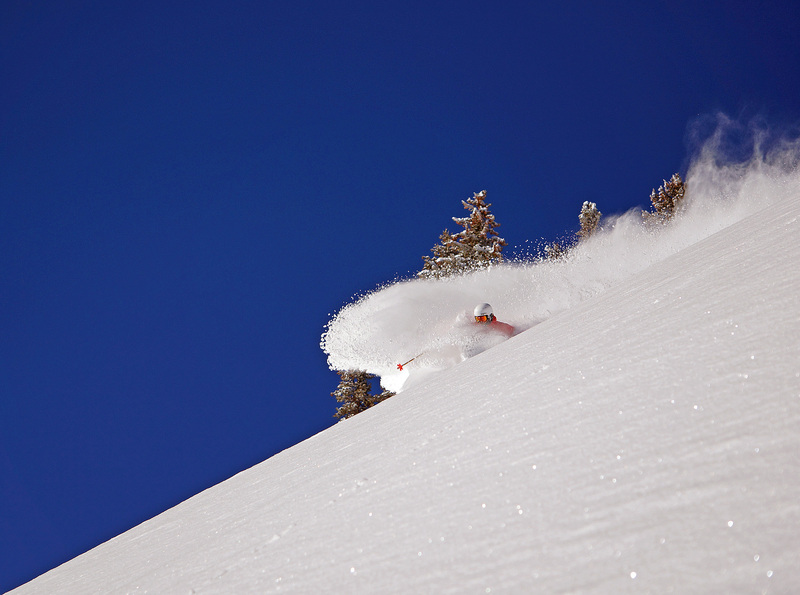 We're calling this your powder day. Rub those legs out, turn up the Gary Clarks Jr. and get ready to rally. Your #1 objective will be to get to the Strawberry Gondola. This will take a little work but stay patient and have faith. Depending on the line, the Needles Gondola will most-likely be your best bet. Catch the Strawberry Traverse over to Philpot Ridge and dive in to whatever looks the tastiest. Now that you've made it Strawberry Gondola, spend the day picking apart the terrain. Sister's Bowl, Moonshine Bowl and Middle Bowl Cirque will all have you yippin' & yappin' for more. When the hunger pains overcome the will to keep skiing, dip in to the Strawberry Cafe for their signature beer bratwursts. The drive to Sun Valley is a quick, uneventful trip when the weather is favorable. Freeway speed limits trend at the 80mph mark, ideal for hitting the cruise control and letting the four and a half hours fly by. For a scenic stop along the way, swing off the freeway into the town of Twin Falls (1.5 hrs from Sun Valley). The view from the Perrine Bridge is quite the sight (the only legal bridge that you can base jump from). Great opportunity to stretch the legs and fill up the rig. If dinner is on the mind once you reach Sun Valley, there's a plethora of options from a quick slice of pizza to eclectic Asian-fusion. Weary eyes from driving coupled with a food induced coma demand a good night's rest. Look no further than the Sun Valley Lodge with its recently remodeled rooms to revitalize the soul. River Run side of Baldy: enjoy the comforts of Baldy's gondola | warm-up run friendly access via the Lower River Run chair. Warm Springs side of Baldy: your best option for a direct shot straight to the top of the mountain | terrain is consistently steep over here but you'll still have access to the rest of the mountain from the summit. Another option is Dollar Mountain: mellow, beginner terrain | terrain park showcasing ample hits of varying magnitude and rail features galore. To take advantage of Baldy's 3,400ft of vertical we recommend heading straight for the Warm Springs side of the mountain. Grab the Challenger lift for a quick 10 minute ride straight to the top. Ease in to things with a lap down Upper College - Flying Squirrel - Lower Picabo's. Next up, feel the burn with a top to bottom ripper down Warm Springs. The rest of the morning is at your mercy. For the sun seekers, check out runs like Lower College, Ridge, Christmas Ridge, and Broadway Face. With virtually non-existent lift lines and Ski Magazine's #1 ranking for grooming, logging 20,000ft of elevation before lunch is the norm, not the exception. Lunch time will be a welcome reprieve. A wide range of cuisine strewn across the mountain awaits you. Our personal recommendation - hit the taco bar at the top of Baldy in the Lookout Lodge. Take the afternoon to enjoy the far reaches of Seattle Ridge and the Bowls. Expect quick groomers and open glades. Sun Valley got its name for a reason. With an average of 200+ days of sun, odds are you'll have a glorious day to enjoy. Catch a quick breather on the sun-soaked patio of the Seattle Ridge Lodge before making your way back to the base. Time for a soak. The Sun Valley Resort is famous for their hot pools - a must-do for soothing the joints. 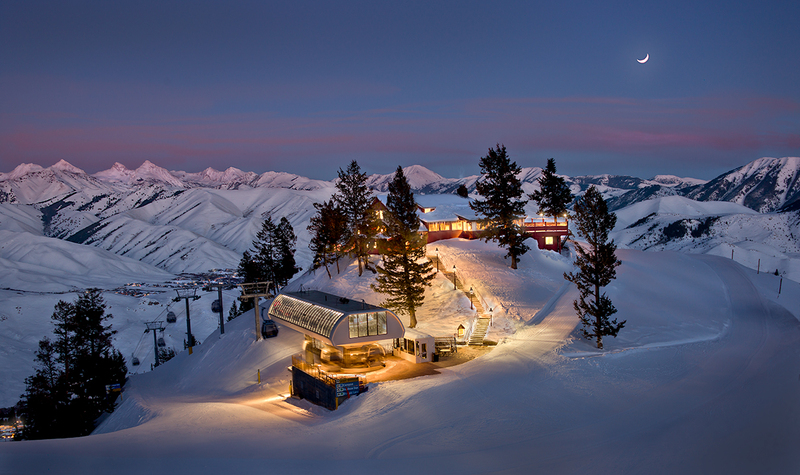 The town of Ketchum sits a mere mile from the Sun Valley Lodge and is the place to venture for dining and nightlife. For classic Americana head to the Pioneer Saloon (get the Jim Spud), Italian inspired - Enoteca (try the flatbreads & Brussels sprouts), sophisticated Mediterranean - Town Square Tavern (grab the corn cakes & the short ribs), or rooftop hotspot - Warfield Distillery (try the spicy cauliflower pakora & the chicken & waffles). To keep the night going, dip in to the Cellar Pub for some shuffleboard, Whiskey Jacques for live music and dancing, or the Casino for pool and jukebox tunes. While you might be hooked on the ease of the bus system, this morning's commute is best navigated via driving the rental rig. Load the car up before heading out for another day on the hill. Swing by Velocio on your way through Ketchum for some scrumptious grab & go morning treats. Venture to the River Run side of the mountain for its ease of access from downtown and bountiful free parking. Today is a great day to explore some of the lesser known stashes around Baldy. Try dipping into the the freshly thinned trees around Jann's Pass and Graduate via Frenchman's lift. Firetrail off the Seattle Ridge zone can be an excellent adventure. Take it beyond the Seattle Ridge base and into the Cold Springs lift for a few more exploratory laps on runs like Inhibition and Three Bears. If you run out of ideas, don't hesitate to ask a local. They're usually more than willing to give you a little insider information. Treat yourself to a bit of history with a stop in to Roundhouse. Built in 1939, this is an iconic piece of Sun Valley's skiing heritage. Order up their classic fondue as you stare out at the sweeping views of the Pioneer Mountains. You just might find yourself rubbing elbows with the likes of Dirty Harry, Arnold or The Boss. Take the last bit of your day to pick apart the nooks and crannies that are strewn about Bald Mountain. Look for clever side line shots in the vicinity of runs like Olympic, Sunnyside Bowl, Upper Limelight, Gretchen's Gold and International. Your visit wouldn't be complete without at least one greasy meal. You've undoubtedly burned more than enough calories to afford a black and blue burger complete with a side of monkey fries from Lefty's Bar & Grill. Treat yourself accordingly. Most map routings will have you heading south bound for I-80. If the weather is inclement, heed their directions. If not, take the scenic route via highway 20 & 26 through the out-of-this-world landscape of Craters of the Moon. Another perk of this routing is that it has the potential to shave some time off your overall trip (weather dependent). Idaho Falls is the biggest metropolitan area along the drive and a good middle point for refueling and shaking out the legs. If the pass from Driggs to Wilson is open, you're in for a lovely first look at the Jackson basin. For a bite to eat in town, check out Thai Me Up for some tasty Thai food and craft beer. Lodging options in Jackson can be a bit overwhelming with the near limitless options. The two biggest factors that come into play are where to stay (in-town or at the resort) and what sort of price-range. Our favorite spot to crash is the Wyoming Inn for their well appointed rooms, comfy beds, western theme, and ease of access to downtown. While the Wyoming Inn offers a solid breakfast, Pearl Street Bagels is the place to head to grab a quick bite for the road. Coffee + bagel + favorite spread = go time. The bus system or park and ride system is highly encouraged to avoid the hassle of paid parking. You can either catch the Start Bus ($3) right out front of Pearl Street Bagels or make the quick drive to the Park & Ride Stilson lot located at the corner of WY22 & Highway 390 and then hop the free shuttle to get you the rest of the way. 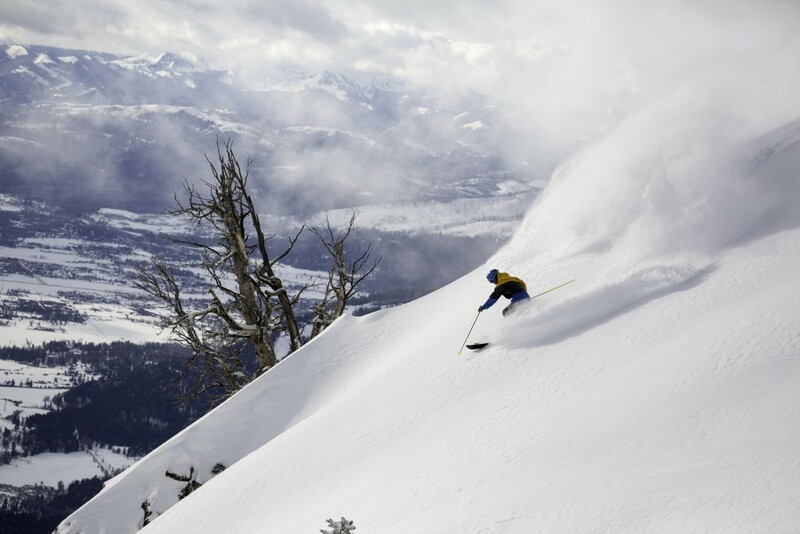 Jackson Hole Mountain Resort can be a little intimidating as you gaze at the 4,139 vertical foot elevation gain to the summit. Fortunately, there are a few mellow options to help you assimilate to the area. Ease the nerves with a lap on the Bridger Gondola down Lupine Way to the Amphitheater to Gros Ventre. As you make your way back to the base of the resort, Big Red will be there beckoning you to put on your big boy/girl pants and take a ride. The Tram is the magic carpet ride to technical skiing nirvana. Even if you don't plan on getting extreme on this particular day, a peek into famed Corbet's Couloir near the top of Hidden Peak is well worth the stop. Don't be surprised to see one of the locals launching into this techy run without hesitation and skiing it with more style than TJ Burke. While it may seem like a cakewalk, this run takes some serious cojones to drop-in. Not to worry if it's not your style. There are plenty of steeps to be had without the free-fall entrances. Routes such as the Alta, Expert, and Tower Three Chutes will still fuel the adrenaline feens. You've undoubtedly worked up an appetite after a hefty morning testing your wits. Take a quick stroll from the base of the Tram to the Spur and reward yourself with the chicken muffletta, an order of the 307 fries, and a spicy margarita. For the afternoon, grab another ride on the Tram and explore the southern reaches of the mountain. Quick laps on the Sublet Chair will give you access to runs Wally World, Bird in the Hand, and the Hoback Bowls. After a big day of skiing, you deserve some time to relax, soak in the sun and enjoy a refreshing beverage. Grab a six-pack from the liquor store (under the Mangy Moose) and head towards Nick Wilson's where you might catch a glimpse of local heroes like Travis Rice, Griffin Post or Jess McMillan enjoying some tasty tunes. Dinner... where to start. So many options but so little time. Those looking to class it up, head for the Snake River Grill and their Cast Iron Seared Elk Tenderloin. For the more laid back environment, saddle up at Snake River Brewing and order the Roper. Snap out of that food coma with a stop at the Silver Dollar Bar. Located in the Wort Hotel, this spot will liven things up with some tasty tunes. Late-nighters, venture to the Rose or the Million Dollar Cowboy Bar. Here we are, the last day of your Mountain Collective road trip and it snowed! Let's go out with a bang. First stop, Persephone Bakery. Order the Croque Madame with a side of Sweet Potato & Brussel Sprout Hash and a proper cappuccino. On the road for another day at Jackson Hole Mountain Resort. We're going to predict that it snowed 18in overnight so let's avoid the early morning Tram line and head for the Bridger Gondola. Sneak your way into Woosley Woods and sink into your first face-shot filled turns of the day. As you emerge from the white cloud, catch the Solitude Traverse over to Jackson's newest lift addition, the Teton Quad. Mind-blowing terrain abounds - it'll be hard to pick a bad run here. Moran Glade, Washakie Glade or Moran Woods - it will all depend on which has less tracks. Don't be afraid to stick around here until you've had your fill. WAFFLES! Time for a tasty mid-morning treat. Yes, Corbet's Cabin at the top of the Tram offers waffles and yes you can get one with peanut butter and bacon. It's a great way to add a quick bite of hearty nourishment while you're on the go. Now we're ready for a bit of gate accessed terrain. Follow the Tensleep over to the Headwall traverse. A quick 15 minute bootpack will put you at the top of some of Jackson's most coveted terrain. Right out of the gate and straight down the fall line lies Coombs run. Make your way further down the line and you'll be like a kid in a candy store peering down runs such as Greybull, Shot 7, and Sheridan Bowl. You might find yourself running back to the gates right until they close at 2pm. With the last bit of gas in the tank, find the north side of the mountain where the Teewinot & Apres Vous quads sit. Off the top, the Saratoga Bowl will be waiting for you to farm those last hidden secret powder stashes of the day. As you make your way back to the base of the mountain, be sure to high-five your friends/family/random strangers for closing out an epic skiing road trip. Don't let the closing of your journey bring on the post ski trip hangover. Instead, use the 5hr drive back to Salt Lake as an opportunity to relive the highlight reel from your epic adventure. Picture those runs that make you smile, the meals that made your mouth water, and the scenery you've experienced all while paying off your Mountain Collective pass. For a little comfort food along the way, take the scenic route through Bear Lake to Garden City, UT. There you'll find LaBeau's Drive Inn. Grab a burger and a raspberry milkshake to ease the pain. Drop the rental car at the Salt Lake City airport and hop on your flight home. Dream up the next epic Mountain Collective road trip.